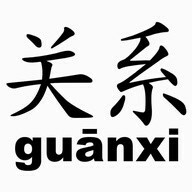 Muskblog » Happy Chinese New Year! 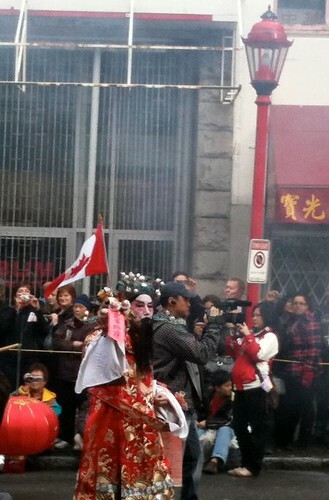 Yes, stuff is happening in Vancouver besides the Olympics and protests. 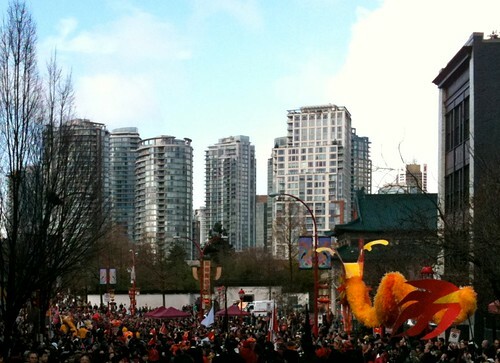 I’ve been working with the Chinatown BIA for almost two years now and BOB moved their offices to Main and Pender so this year we asked and were allowed to march in the parade. It was a big hit with staff for the most part, well except for Ada’s husband maybe. 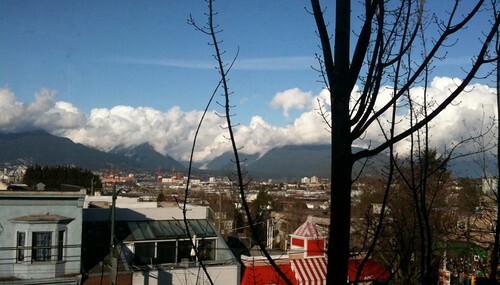 The weather was nice, but now after my impromptu nap, the weather has turned glorious in East Vancouver. I was marching and holding our banner so I’m not sure how my photos will come out. The night before I wandered through Yaletown and down Granville Street ending up in the Lennox where I drank with the people I lined up with. We had a good time and despite watching the director’s cut of “Once upon a time in the West” I was the first to arrive at BOB’s HQ. Canada won it’s first medal last night. I watched it on TV and there was lots of chanting of “U-S-A” and “Can-a-da”, no one chanted the new fake cheer, I tried to get people to chant “Nip-pon” but that never caught on either. The top channel in Germany was there to get interviews and reaction shots. They interviewed Kerry or was it Kelly at my table. He was worried as he’d been drinking hard, but I told him he was very diplomatic about the Americans winning bronze and gold, and Canada’s skier settling on Silver. I looked again for some reactions from the blogosphere and didn’t find a lot in Google’s blog search, this is a real test of that algorithm and for the most part it seems to be failing, by RSS feeds turned up the good stuff. Borris seems disappointed in CBC, but I never expected miracles. I got my iPhone but I mainly use it as a camera and upload through iPhoto and my Mac to Flickr. One story I and apparently all of Russia are interested in is whether the NHL will allow a stoppage in their schedule so that players can play in Sochi next Winter Olympics. I’m pretty sure they’ll have snow, but the time zone won’t be US TV friendly. Russian players and of course influential Canadians want the show to go on, why you’d take hockey off the third biggest world stage, isn’t even a question that people should be debating. It’s good fun and a good showcase for the sport, like an allstar game that actually means something. We still have no snow, but the sky and mountains are looking great, Whistler at least on the biathlon course had enough snow. Canada won it’s gold medal on home soil and now they have to find a new angle. I had a hard time getting my photos off of my iPhone but I got a few good ones, even though walking, carrying a banner, and taking photos is not that easy. 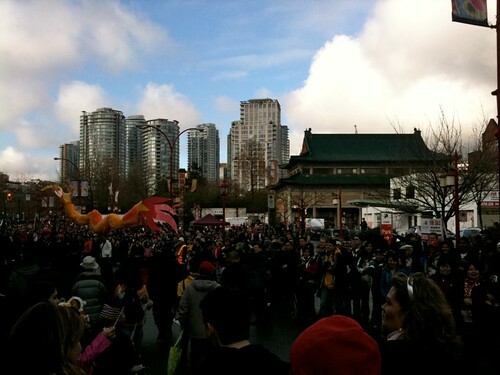 This entry was originaly posted on February 15th, 2010 , it was last edited on April 2nd, 2019 and is filed under: Canada and tagged: Chinatown, Chinese New Year, Olympics, Vancouver, Vancouver 2010.